Covering some six kilometres each day by foot to bolster this invaluable home education with rural school, an affiliation and ever-blossoming passion for agriculture soon led him to Kenya’s Egerton University. 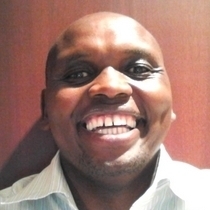 There, Paul excelled throughout his undergraduate course in Agricultural Sciences, and was thus hand-picked by his professors to proceed to a Master’s degree in Crop Sciences at the self-same university, before going on to obtain a German Academic Exchange Service (DAAD) scholarship to undertake a ‘sandwich’ PhD in Plant Physiology and Crop Breeding at Egerton University and the Leibniz Institute for AgriculturalEngineering (ATB) in Berlin, Germany. Inspecting pod maturity with farmers at Koibatek Farmers Training Centre in Eldama Ravine Division, Baringo County, Kenya, in September 2012. Paul is on the extreme right. 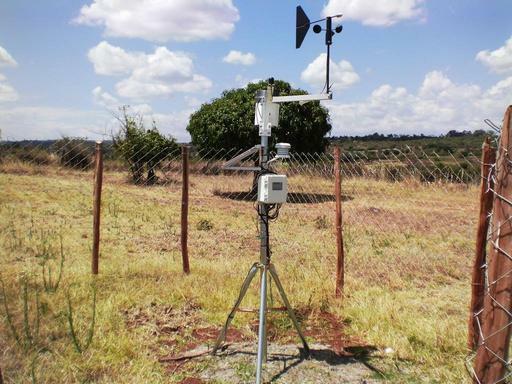 This GCP-funded weather station is at Koibatek Farmers Training Centre. Having such a back-up in place can prove a vital lifeline to farmers, Paul explains, particularly during moments of crisis, citing the 2011–2012 outbreak of the maize lethal necrosis (MLN) disease which wiped out all the maize throughout Kenya’s Bomet County, where Paul, Richard, Bernard and their team had been working on the chickpea reference set. Those farmers who had planted chickpeas – Paul recalls Toroto and Absalom as two such fortunate souls – were food-secure. Moreover, GCP support for infrastructure such as a weather station have helped farmers in Koibatek County to predict weather patterns and anticipate rainfall, whilst an irrigation system in the area is being used by the Kenyan Ministry of Agriculture to develop improved seed varieties and pasture for farmers. The science behind the scenes and the resultant products are of course not to be underestimated: in collaboration with ICRISAT, Paul and his team released four drought-resistant chickpea varieties in Kenya in 2012, with the self-same collaboration leading to the integration of at least four varieties of the crop using marker-assisted backcrossing, one of which is in the final stages and soon to be released for field testing. With GCP having contributed to the recent sequencing of the chickpea genome, Paul and his colleagues are now looking to up their game by possibly moving into work on biotic stresses in the crop such as diseases, an ambitious step which Paul feels confident can be realised through effective collaboration, with potential contenders for the mission including ICRISAT (for molecular markers), Ethiopia and Spain (for germplasm) and researchers at the International Center for Agricultural Research in the Dry Areas (ICARDA) for germplasm. Paul first established contact with all of these partners during GCP meetings. Links that flower, a roving eye, and the heat is on! In the meantime, the fruits of other links established since joining the GCP family are already starting to blossom. 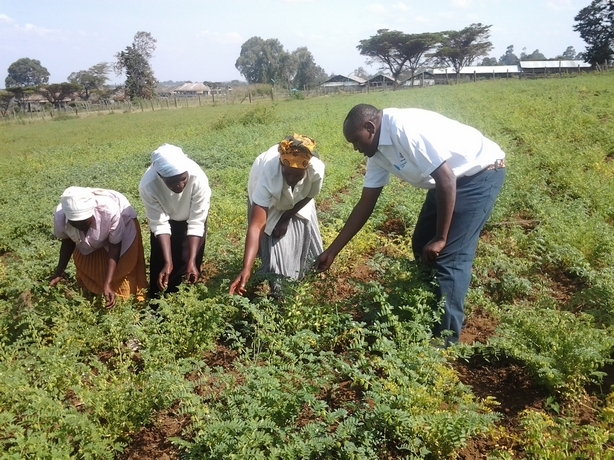 For example, TLI products such as certified seeds of chickpea varieties being released in Kenya – and in particular the yet-to-be-released marker-assisted breeding chickpea lines which are currently under evaluation – caught the eye of George Birigwa, Senior Programme Officer at the Program for Africa’s Seed Systems (PASS) initiative of the Alliance for a Green Revolution in Africa (AGRA), which is now supporting the work being undertaken by Paul and his team through the Egerton Seed Unit and Variety Development Centre (of which Paul is currently Director) at the Agro-Based Science Park. Yet whilst Paul’s love affair with chickpeas has evidently been going from strength to strength, he has also enjoyed a healthy courtship with research in other legumes: by engaging in a Pan-African Bean Research Alliance (PABRA) bean project coordinated by the International Center for Tropical Agriculture (CIAT), Paul and his team were able to release and commercialise three bean varieties which are currently in farmers’ fields in Kenya. Paul (left) in the field. The crop is chickpeas of course! With so many pots on the boil, the heat is certainly on in Paul’s research kitchen, yet he continues to navigate such daily challenges with characteristic aplomb. As a proven leader of change in his community and a ‘ can-do, make-it-happen’ kind of guy, he is driving research forward to ensure that both his school and discipline remain fresh and relevant – and he’s taking his colleagues, students and local community along with him every step of the way. 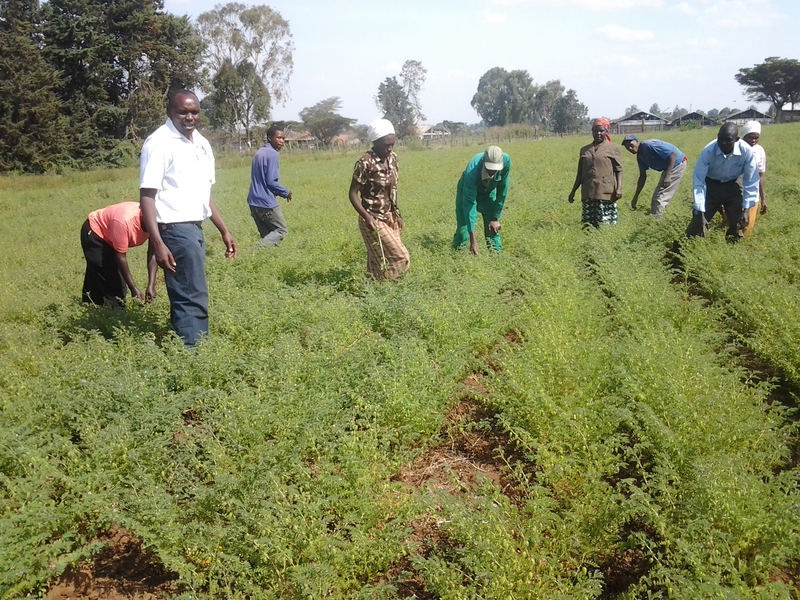 With the chickpea research community thriving, resulting in concrete food-security alternatives, we raise a toast to Paul Kimurto and his chickpea champions!